The latest news from Merle Wood and Peter Croke at Merle Wood & Associates is that they've taken over the central agency for sale of the 58.5m motor yacht Islander and overseen a hefty price reduction of nearly $5 million. Originally built as an ABS classed motorsailer by Australian Yacht Builders in 1991, she's currently in Palatka, Florida, completing a $2 million refit that sees her masts and keel removed to convert her to a motor yacht. Her interior is also being refurbished and electronics upgraded, along with a repaint of the exterior. 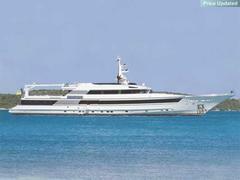 Sleeping up to 13 guests in a master, three doubles and a twin plus three Pullman berths, Islander was asking $24.95 million but is now on offer at $19.995 million.